Montreal: The punishing serve that propelled Karolina Pliskova to the top of the tennis world last year proved ineffective against Kiki Bertens at the Rogers Cup in Montreal on Wednesday as the Dutchwoman cruised to a 6-2 6-2 victory. The ninth-seeded Czech failed to record a single ace in the second-round battle but committed eight double faults and was broken seven times by the defensive-minded Bertens. Bertens will next meet eighth-seed Petra Kvitova, who advanced past Estonian Anett Kontaveit 6-3 6-4 in their second-round battle on Tuesday. Wimbledon champion Angelique Kerber came crashing back to earth after she beat Serena Williams in the grasscourt final last month, falling 6-4 6-1 to Alize Cornet of France. The fourth-seeded German committed 32 errors to help Cornet reach the third round, where she will face Australia’s Ashleigh Barty, who defeated Belgian Alison van Uytvanck 7-6(7) 6-2 in her second-round match. Romanian Mihaela Buzarnescu was forced to retire from her second-round match against fifth-seeded Elina Svitolina with the score 6-3 6-7(5) 4-3 after she suffered a right ankle injury. The 30-year-old slipped on the baseline while running down a shot and immediately collapsed in tears. She eventually left the court in a wheelchair, waving to the crowd as it rose to give her a standing ovation. 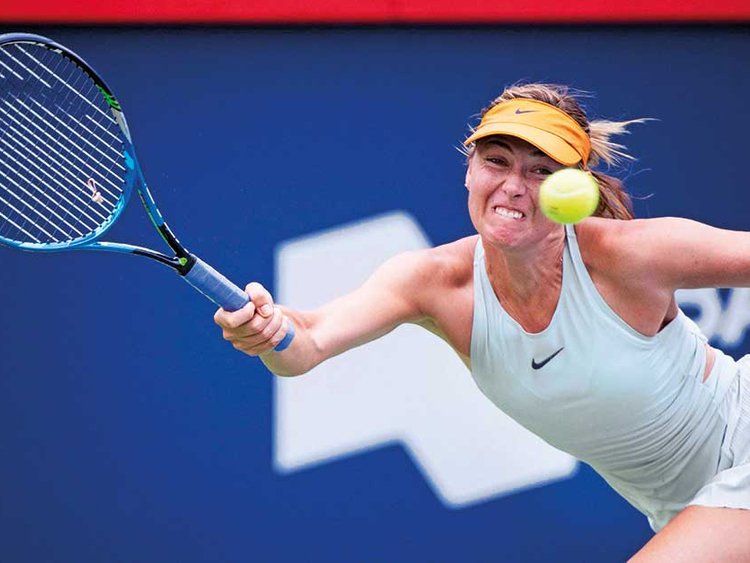 The unseeded Maria Sharapova made quick work of fellow Russian Daria Kasatkina during their first meeting with a convincing 6-0 6-2 win and will face sixth seed Caroline Garcia of France in the third round on Thursday. Third-seeded Sloane Stephens thrashed 21-year-old Francoise Abanda, dispatching the Canadian 6-0 6-2 in 80 minutes. The 25-year-old American is looking to sharpen her game ahead of her US Open title defence after disappointing results at Wimbledon and the Citi Open last month, where she was eliminated in the first and second rounds. Rain forced two late matches to be halted, with top seed Simona Halep trailing Russian Anastasia Pavlyuchenkova 4-3, and British number one Johanna Konta leading Victoria Azarenka 6-3 3-0. Both second-round matches will resume on Thursday.